We are particularly interested in synchronizing our control center because that allows us to act like human beings. One goal of the Life Model is to achieve as close to ideal functioning of our minds as possible when it comes to developing our identities. Interestingly, our ability to make the parts of our own brain work together is first learned by having someone else synchronize their brain with ours. This synchronization is developed by right-hemisphere-to-right-hemisphere communication from a trained control center in one person to an untrained control center in another person. Right-hemisphere-to-right-hemisphere communication requires face-to-face interaction between two people. 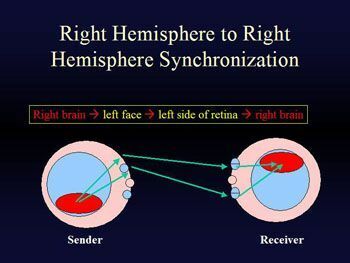 Right-hemisphere-to-right-hemisphere communication is so fast it completes six cycles of communication every second. This rapid and authentic communication creates a momentary mutual mind between the two brains. 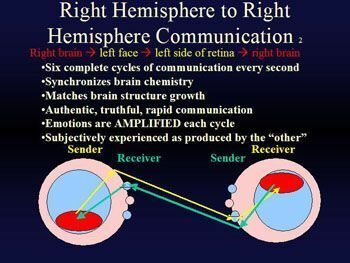 Right-hemisphere-to-right-hemisphere communication occurs when the right brain of a sender puts authentic emotional information on the left side of his or her face. This expression is perceived by the left side of the retina of both eyes in an observer and sent directly to the observer's right brain. 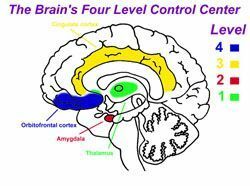 This process is quickly reversed and the right brain of the receiver becomes the sender, putting information about their authentic emotional state on the left side of their face where it is sent back by the same mechanism to the right side of the brain that originally started the process. This communication is so fast the six complete cycles of communication are achieved every second. Within seconds, right-hemisphere-to-right-hemisphere communication produces matching emotional states in the two brains. The brains become synchronized in their brain chemistry and emotional states. These emotions are amplified each cycle so that a very small emotion can become a strong emotional interaction within a matter of a few seconds. These emotional states are as subjectively experienced as though they were produced by the other person. Consequently the people are locked in right-hemisphere-to-right-hemisphere communication say “you are making me feel happy or sad or angry or whenever the emotion might be. When one brain is mature and the other is a child or infant, this right-hemisphere-to-right-hemisphere communication has strong, formative effects on the younger brain. During critical periods of brain development, the younger brain will begin to match the older brain's chemistry, the younger brain will duplicate the older brain structures. The older brain duplicates itself in the younger one. When a mother links right hemispheres with her baby, she can produce increasing levels of joy for the baby. When the joy reaches the highest level that the baby can stand, a good mother will turn off her amplifier and allows the baby to rest. This rest allows the baby to learn self-quieting. While early life self-quieting is practiced using joy, eventually the baby uses the same mechanism to learn to quiet his or her distress. Synchronizing can be very hard work for babies and requires all of the capacity their developing nervous systems have available. Leaning how to quiet themselves is the best predictor of mental health for a lifetime.